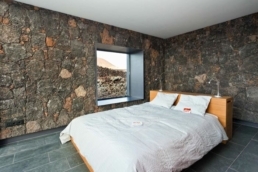 Fuerteventura: Yoga, and So Much More - Yoga Kula. Where do I even begin when trying to convey what a wonderful trip this was? 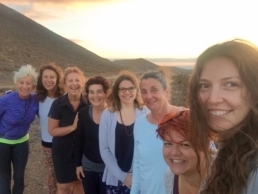 I didn’t even know that Fuerteventura existed before Yoga Kula posted this retreat onto their website, but now I will never ever forget it, and I am just waiting for an opportunity to get myself back out there! Let’s start with the Villa. It is a modern, minimalist, heaven. Think meditation gardens, think lava rock walls, think mountain views and beautiful sunsets. Not at all what I expected. We had a gorgeous pool, multiple chill-out spaces and all our yoga was outside—an amazing luxury for us Brits! But forget the accommodation and the yoga for a second, because this trip was so much more than that. Angela and the team couldn’t have planned a better experience for all of us. We had the opportunity to go on a sunset boat trip, surfing, paddle boarding, eating out, volcano walks and sunrise meditations, visits to the local market and town, beach hang outs and ice-cream, Clare Kerrigan even put on a night-time Nidra for us under the starry sky (with our pillows and duvets!!). It felt more like a luxury summer camp for adults, but with more freedom and lots of Honey Rum (possibly the best reason to get yourself over to Fuerteventura). Being immersed in the beautiful practice of yoga, as well as wonderful people, food and experiences made for one of the best holidays I have ever been on – and that is what I see it as, a holiday. To call it a yoga retreat almost does it an injustice, though the yoga was obviously top notch (I wouldn’t expect anything less from any of the teachers here at Kula). No one thing was left to chance; Angela made sure we had Pukka Tea a-plenty, snacks galore and so many activities to choose from that it has set a high standard in what I expect a retreat to be – you could say she spoils her yogis and yoginis! I know I will be on the look-out for the next time I can make this trip, I get a small pang of jealousy whenever I hear the next group talking about heading out there again! But to be honest, a blog post cannot put across the feeling of that trip. It was so full of laughter, good people and wonderful memories that you would have to experience it for yourself to truly understand the magic of Fuerteventura.